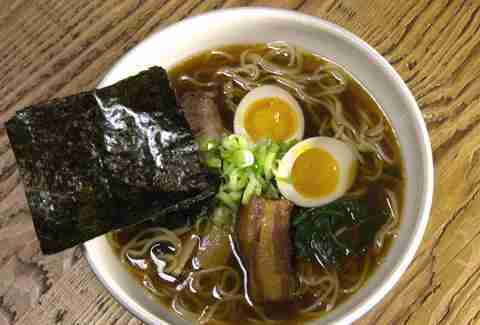 No noodle in the last decade has slurped its way into the hearts/minds/stomachs of Americans quite like ramen. 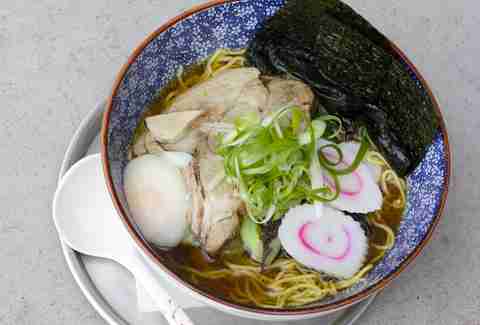 So to honor the new class of ramen-yas, we've compiled a list of the best shops that have opened in 2014 and 2015. We purposefully excluded shops that are opening second locations (Ramen Tatsu-Ya, Orenchi Beyond) or moved into new digs (Mu Ramen, Ivan Ramen). Understandably there's some crossover with our list of 33 best shops in the country, but we wouldn't have it any other way. Read on to learn about the newest noodles around, and if we missed one of your favorites, feel free to spill a little broth in the comments. Osaka just opened its doors in early May but is already drawing rave reviews. 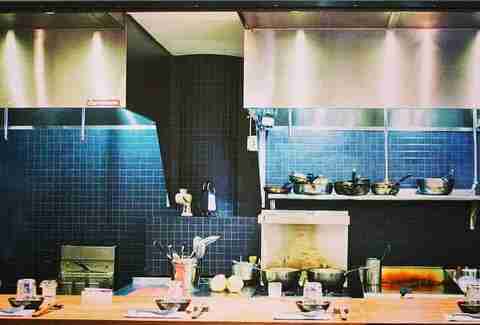 The chef formerly ran an upscale modern-American restaurant in the Denver area, but closed it to go back to his Japanese cooking roots. It's rocking all the main broths (tonkotsu, shio, shoyu, spicy miso), as well as a Thai green-coconut curry for vegetarians. Small plates round out the menu, with everything from the typical gyoza to creative takes on Japanese dishes like a tamago gohan egg rice dish with house-made kimchee. There's a ton of great ramen in Los Angeles, but aside from Little Tokyo, there aren't many Downtown options. 3rd Generation aims to fill that gap with a serious sake bar and a ramen program helmed by a Japanese chef who loads his bowls with a hearty six slices of chashu and a 12-hour tonkotsu broth that fans say is a more authentic representation than is usually seen stateside. 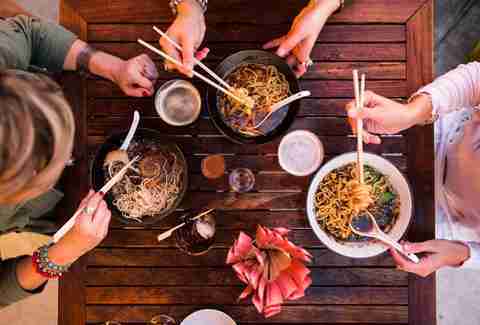 In an effort to keep things local, they get their noodles from a small distributor in Northern California, and have vegans covered with a vegan tomato-based bowl that features tofu noodles. Large, foodie-centric markets are opening across the country, and Baltimore is the lucky recipient of one. 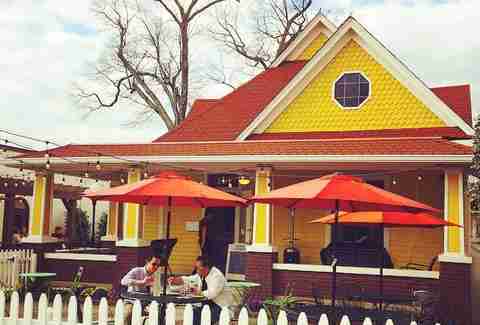 Opened in October 2014 at Belvedere Square Market, Ejji takes Japanese ramen and infuses it with Malaysian flavors. 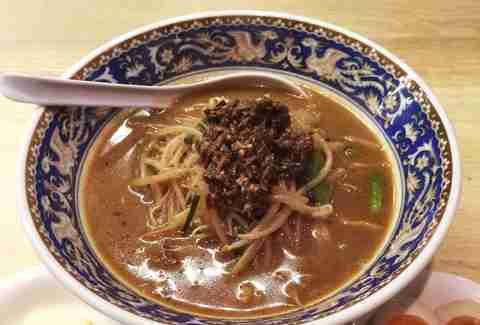 Its curry shellfish Laksa Ramen is the best example of the fusion, but it also offers tonkotsu and miso for more traditional slurpers. The noodles come mostly from Sun, with choices like thin or thick and wavy, but it also offers vegetarian-friendly, house-made veggie noodles comprised of carrot, jicama, and zucchini. 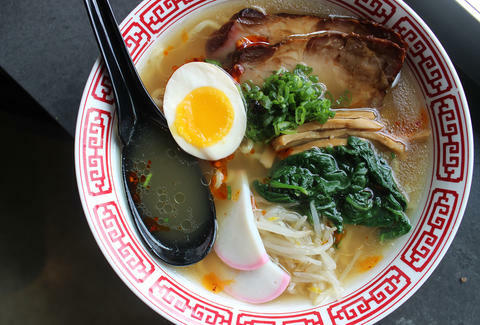 Ramen hit Detroit in a big way last September. And while it does a mean shoyu and miso, Johnny made the cut for our 33 best ramen spots in the country for the lesser-known Japanese variants like the seafood-filled Champon, and off-the-wall bowls like the pickled tomatillo Southwest #2 and tomato broth minestrone. Bonus points for the tableside-torched mackerel and bacon fried rice. A few bowls of ramen. No apps. Nothing else except just booze. High Five's drawing two-hour lines for its tiny, 16-seat ramen-ya thanks to bowls that include a tonkotsu with miso that it caramelizes on the wok, then adds a load of dried chilis and a double dose of peppercorns from both China and Japan. The result is a citrusy, tongue-numbing bowl that's unlike anything you'll find elsewhere. Chelsea Market has become a magnet for ridiculously good restaurants, and Mokbar is no exception. The chef's Korean background creates bowls like the kimchee bacon ramen (based on the dish jjigae) and vegan miso with Korean soybean paste, as well as a bowl topped with black-bean sauce that's extremely popular in Korea, but rarely seen elsewhere. Paying homage to Korean barbecue, it also offers a bulgogi version, but the real standout are the ramen gravy-topped disco fries. 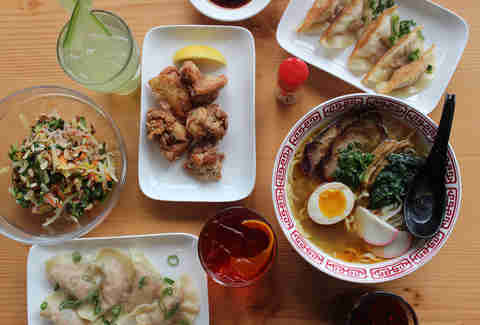 Although Portland's Biwa does much more than ramen, its noodles were good enough to earn a spot on our list of best in the country. 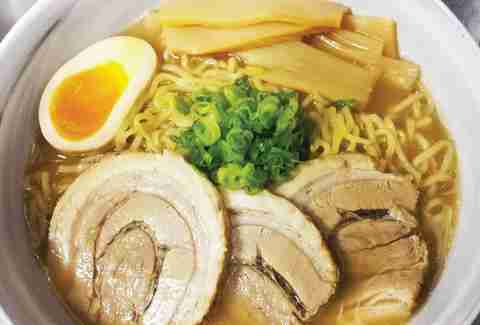 So it's no surprise that its new, dedicated ramen-ya, Noraneko, is receiving high praise. The straightforward menu eschews the ever-popular tonkotsu in favor of subtler shio, shoyu, and miso broths, and also features snacks like chicken kara age. The full menu is served until 2am, along with a a serious sake list and a list of seldom-seen soju cocktails. A collab between a Sonoma sushi master and one of SF's most prominent chefs, The Ramen Bar specializes in a lighter, Tokyo-style, chicken-based broth spiked with a salty dose of soy. For pork lovers, it'll occasionally run a tonkotsu special, but the more mouthwatering off-menu item is a duck broth bowl with a crispy miso duck wing. Two-day soy-cured eggs round out all the bowls, and it goes the extra mile with its drink program by making its own bubble tea. California knows how to ramen. 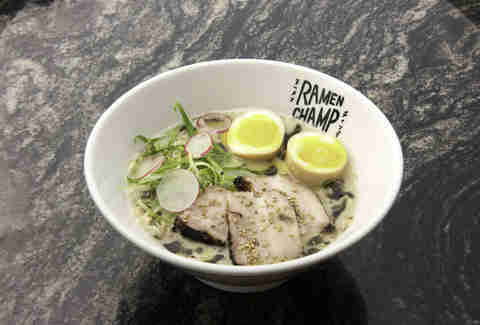 Further proof, the newest Cali inductee to our 33 best: Ramen Champ. The shop's run by a chef known for egg skills, so the soy-soaked huevo is naturally out of this world. Plus it's heavy on the farmers market veggies, and offers bonuses like fried takoyaki balls. After running a successful family restaurant in Korea, the owners of Hakata took a whirlwind tour of Japan and New York to absorb themselves in ramen culture in order to bring the noodle of the moment to the Dallas area. A mix of miso and tonkotsu is the specialty, but they've also got a seaweed broth and fun extras like tantanmen (spicy ground pork and green onion-based soup). 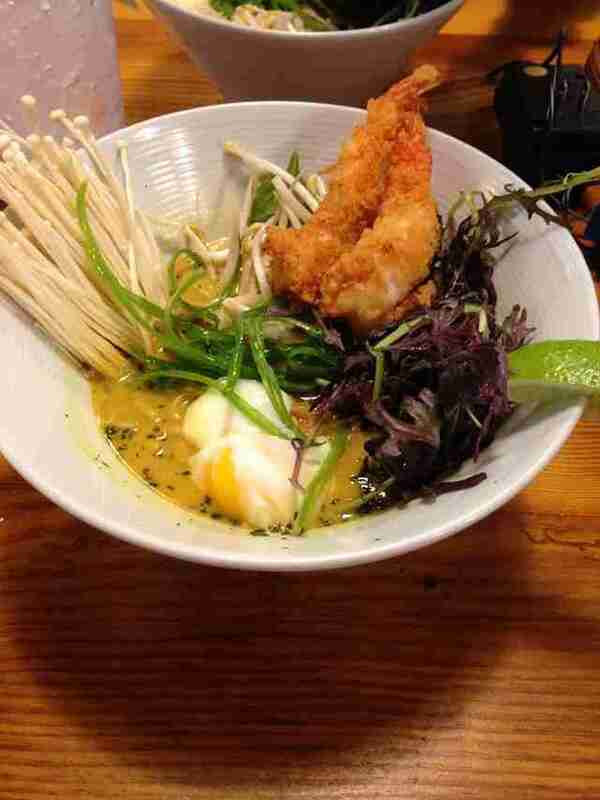 And there's nothing like a cold ramen to combat the Texas summer heat. 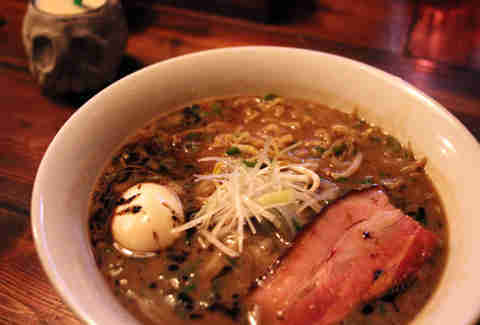 Ramen Lab is one of the 33 best ramen spots in the country for the ability to school both your taste buds and your mind. This flavor laboratory is spearheaded by Sun Noodles, the go-to supplier for most of the nation's best shops, and a chef who was recognized as a master in Japan at the age of 25. The Torigara Shoyu chicken broth is made from a 105-year-old recipe, so the only reason not to order it would be if it unveiled its forthcoming ramen flight menu option. 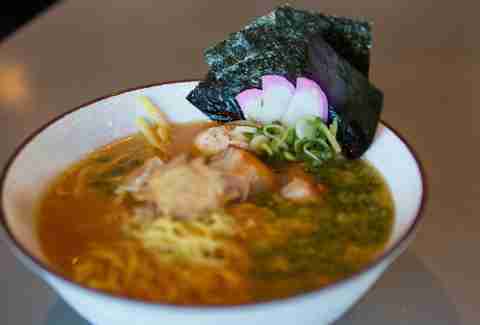 Memphis isn't known for its Japanese food, but in the last year, a pair of ramen shops have brought the trend to Tennessee. Robata is the local favorite, thanks to the cooking of a Japanese chef who spent time cutting his teeth in California's crowded ramen scene. The pork broth simmers for 10 hours, which isn't as long as some, but is leveled up with a dose of miso that takes the flavor to the next level. In addition to the ramen, it's also got a serious selection of meat skewers and tempura specialties like fried squid. Chicago noodle heads might say that they don't need any more slurp shops... and those people are wrong. Strings is strong enough to get tapped for our 33 best ramen spots in the country thanks to an arsenal of secret weapons up its broth-stained sleeves: an imported Japanese noodle machine, 48-hour Berkshire broth so thick they call it pork milk, and seldom-seen proteins like duck breast. The head ninja behind Ninja Ramen has been chasing noodles for over 10 years, but just managed to launch his own operation in May of 2014. 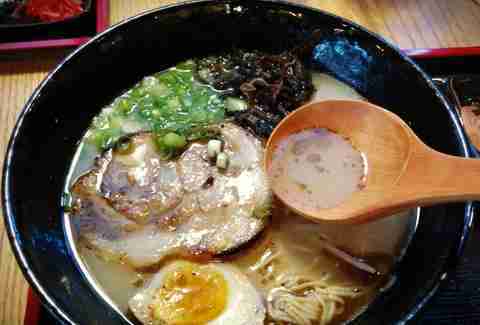 It's gravitated towards a lighter, medium-bodied broth that's rarely seen in the US. 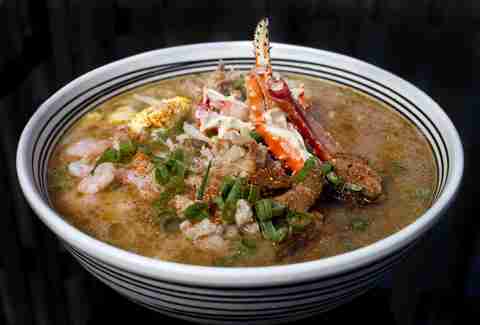 The asahikawa broth mixes pork and seafood because both proteins are popular on its birth-island of Hokkaido. The fish and kelp in the broth gives it an umami kick without having to add as much salt, as with traditional pork broths. Add an egg that's been soy-cured for five days, pork belly that's been aged for a day, and one of the largest selections of Japanese spirits and beers in the state, and you have a shop worth a serious slurp. Two Ten opened in January 2014 and barely made the cutoff for this best of, but since its opening, it's endeared itself enough to Nashville that it has already opened another shop a few hours away in Chattanooga. 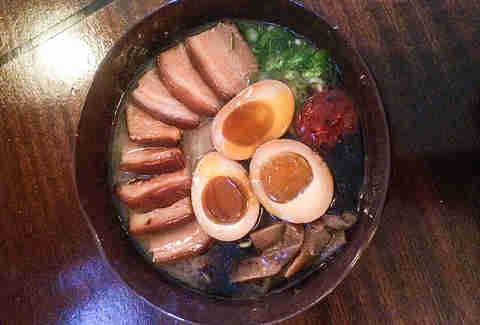 Despite an expansive menu featuring sushi, yakatori, and on-tap soju cocktails, the ramen gets rave reviews for tonkotsu and much rarer tori paitan, a creamier cousin of shio that's made from chicken bones simmered for 16 hours. Dan Gentile is a staff writer on Thrillist's national food and drink team. He always drinks a little bit of broth straight from the bowl. Does anyone else do that? Follow him to awkward realizations at @Dannosphere.